We are back with another Washington Capitals “what if today didn’t happen the way it happened back then?” After a brief sojourn into an episode in which a player departed the organization to great effect, we return to an instance in which a player was brought into the organization. July 22, 1996, was Day 3 of the 1996 Summer Olympic Games in Atlanta, but several hundred miles to the north, the Capitals dipped into the free agent market. The team was coming off a decent season, which is to say “typical.” In the 1995-1996 season, the club finished with a 39-32-11 record, good for fourth in the Atlantic Division of the Eastern Conference, the seventh-seed in the playoffs that season. They drew the second-seeded Pittsburgh Penguins in the first round and lost in six games, a series that featured a four-overtime game, which of course, the Caps lost. In the 1995-1996 season, the Caps’ blue line contributed some offense with three defensemen – Sergei Gonchar (15-26-41), Sylvan Cote (5-33-38), and Calle Johansson (10-25-35) – posting at least 35 points. However, there was quite a drop-off after that to Mark Tinordi (3-10-13). In the playoffs, though, the defense was barely heard from in terms of offensive contributions. Gonchar was 2-4-6, and Cote was 2-0-2. That did it for defensemen with any points in the six-game series against the Pens. Which brings us to late July the following summer. They signed 14-year veteran Phil Housley to a three-year/$7.5 million contract. Housley, who had several teams from which to pick as an unrestricted free agent, chose the Caps because “the other teams weren't going in the same direction as the Capitals. Right now, they have the goaltender [Vezina Trophy winner Jim Carey] and the defense that can carry a team through the low-scoring games." One might have been led to believe at the time that Housley was the last piece of the puzzle, the player who could deliver the mail from the blue line on offense. After all, Housley was a defenseman who had fewer than 60 points in a full NHL season (not counting the injury-shortened 19993-1994 season) only once in 13 seasons, and that was a 43-point year in the lockout-shortened 1994-1995 season. With Gonchar, Cote, and Johansson, the Caps could ice a formidable foursome in terms of offensive threat from the blue line. Yeah, well, that was the plan. What was not in the plan was the Caps having only two defensemen dress for more than 65 games in the 1996-1997 season. Housley was one of them (77 games), Ken Klee was the other (80 games). Gonchar, Cote, Johansson and missed a combined 67 games, and while those three finished second, third, and fourth, respectively, in defenseman scoring (Housley was first with 40 points), it was not the output foreseen when the Caps assembled this defense. Worse, the Caps missed the postseason after a 14-year run in reaching the playoffs. The result was due, in no small part, to the team missing a total of 361 man-games to injury. But it also had its origins in the weak play at goaltender. The Vezina Trophy winner that Housley alluded to in describing his decision process in choosing the Caps, Jim Carey, imploded. After a ghastly 1996 postseason (0-1, 6.19, .744 in just 97 minutes played), Carey went 17-18-3, 2.75, .893 in 1996-1997 (not awful by the standards of the time, but not good, either), and he was traded late in the season as the team was falling out of playoff contention. In terms of the defense, Housley was not the “last piece” of what could be a championship-caliber team, he was the “only piece” of a defense decimated by injury and a team that managed just 75 standings points, ninth-lowest for a full season in club history to that point in time. The Caps stormed out of the gate in the 1997-1998 season, the team going 7-1-0 in their first eight games. Housley might have done likewise, going 1-2-3, plus-4, in his first five games, but then he was sidelined for three games (all Caps wins). It barely slowed him down, though. In the first 29 games of the season in which he dressed, he was held without a point in consecutive games only twice and went 3-20-23 in those games. Then, his offensive output dried up. From December 13th in Los Angeles against the Kings through January 21st in Tampa against the Lightning, Housley went 14 games without a point. He broke the drought with a goal against the Boston Bruins on January 25th, a 4-1 Caps win, but then he went another eight games without a point. Housley recovered to finish the regular season 2-5-7 in his last dozen games, although three of those points (all assists) came in a 6-3 win over the Florida Panthers on March 7th. 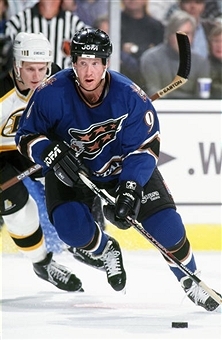 It ended up being a frustrating season for Housley, who missed 18 games in the regular season and finished with just 31 points, his lowest total for a full season to that point in his career (not including the injury-shortened 1993-1994 season in which he had 22 points in 26 games). It hardly improved in the postseason for Housley. With the Caps going on a roll, winning three series to reach the Stanley Cup final for the first time in franchise history, Housley was scratched for three games in the second-round series against the Ottawa Senators. He averaged barely 12 minutes in the 18 games in which he did dress for the postseason (only Brendan Witt had a lower average among the six defensemen who appeared in at least ten games) and had four assists (no goals). When the Detroit Red Wings defeated the Capitals, 4-1, to complete a four-game sweep of the Stanley Cup final, it brought down the curtain on Phil Housley’s career in Washington. The Caps placed him on waivers in July, and he was claimed by the Calgary Flames. And we finally get to the “what if” portion of the piece. What if Housley had not been signed in the summer of 1996? Looking at his body of work as a Capital, it is tempting, to say the least, that little would have changed. In two years with the Caps, he did go 17-54-71 in 141 games, but over time he became largely a power play specialist. His minus-20 was tied for 182nd among 205 defensemen appearing in at least 50 games over the 1996-1997 and 1997-1998 seasons (to be fair, Brendan Witt was minus-31 over the same two seasons, but those were his second and third seasons in the league). His one postseason with the Caps was as a support player with limited exposure who seemed to fall out of favor of head coach Ron Wilson. However, of his 21 NHL seasons, Housley’s 11 goals in 1996-1997 is tied for the sixth lowest total in his career, while his six goals in 1997-1998 is tied for second lowest. Similarly, his 40 points in 1996-1997 is the sixth lowest total of his career, while the 31 points he posted in the following season is third lowest. Those years were even worse compared to his other NHL stops. Housley played in at least 20 games for seven franchises in his career (plus one game for the Toronto Maple Leafs). His goals per game with the Caps was sixth best of the seven teams for which he played. His points per game was tied for sixth. His shots on goal per game was worst with the Caps among the seven teams. His postseason numbers might be considered disappointing. In his two years with the club he appeared in just one postseason and was the only Capital defenseman of seven appearing in more than two games not to record a goal. He had only two even strength points, one fewer than Joe Reekie, whose stock and trade was not in the offensive end of the ice. It would be reasonable to conclude that had Housley not been signed by the Caps in 1996, the 1996-1997 season would not have been appreciably different. The 1997-1998 season is a bit more nuanced. There were all those injuries on the blue line that held Mark Tinordi to 47 games played, Sylvain Cote to 59 games, and Ken Klee to 51 games. Housley missed 18 games that season himself. Had Housley not been a Capital that season, the team might have had to put Brendan Witt, in just his third NHL season and first appearing in more than 50 games, in more responsible (and vulnerable) situations. And, the Caps might have had to give defensemen such as Jeff Brown (nine games that season), Stewart Malgunas (eight), or Nolan Baumgartner (four) more appearances. Or, the team might have had to swing a deal for a defenseman. It is a stretch to think that the Caps would have finished out of the playoffs with Housley never having been a member of the 1997-1998 team that went to the Cup final. After all, they did finish 18 points ahead of the Carolina Hurricanes in the Eastern Conference. But it could have upset the seedings enough to give the Caps an unfavorable matchup as early as the first round. Consider that the Caps finished just five points ahead of the seventh-place Montreal Canadiens. If the Caps were five or more points worse without Housley – not beyond imagination – the Caps would have drawn the Pittsburgh Penguins in the first round, a team against which the Caps were 1-1-2 that season (two overtime ties) and a team against which the Caps were already 1-4 in postseason series. If Phil Housley had never been a Capital, it is possible – if not likely – that the Caps would still have only 1990 as a year in which they advanced past the second round of the playoffs and would still be looking for their first trip to a Stanley Cup final.